For many, owning their own business is a dream. Got the itch? You should go for it. The first thing you may hear about starting a small business is that it’s all about location, location, location. But when thinking of the best place to start a business, it’s not just about the location within a city, it’s about the city itself. Square recently took a look at where specific types of businesses are experiencing the most revenue growth. 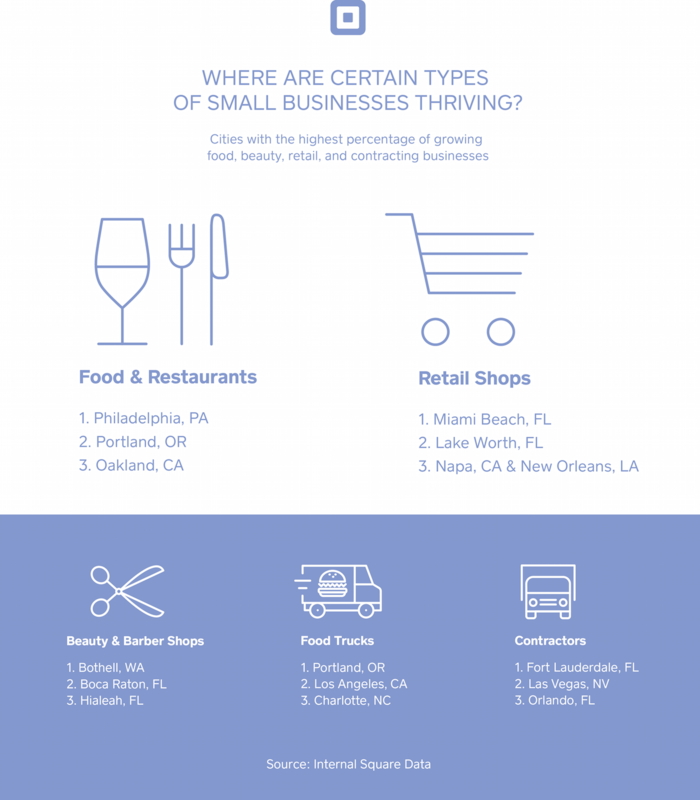 This data looks at food and restaurant, retail, health and beauty, and contractor businesses that use Square in order to see in which U.S. cities those industries are thriving the most. The findings could be helpful as you think through the best businesses to start in your area. If you’re looking to open a restaurant or another business in the food industry, two cities rise above the pack. Philadelphia, Pennsylvania, reigns number one in the restaurant category — with 66 percent of restaurants selling with Square experiencing revenue growth there over the past year, the highest percentage of all U.S cities. When it comes to food trucks, however, Portland comes in first — 61 percent of food trucks there are growing in year-over-year revenue. Interestingly, the best-performing cities in the beauty industry aren’t in major metropolitan areas. Salons and barbershops are thriving in Bothell, Washington; Boca Raton, Florida; and Hialeah, Florida — 57 percent, 56 percent, and 56 percent of beauty businesses are growing in those cities (respectively). Perhaps because of the year-round warm weather, those who live in Florida might consider contracting — the data indicates that it could be one of the best businesses to start there. Fifty-three percent of businesses in that sector are experiencing growth in Fort Lauderdale, and in Orlando it’s 51 percent. Florida could also be a hot spot for retail. Fifty-four percent of businesses in Miami Beach have experienced revenue growth in the past month. Learn more on how to start a retail business. Overall, this data can point to a couple of things. Beyond the fact that certain businesses in those cities are obviously doing something right, the numbers could also illustrate which locations have a strong appetite for specific services or products. But if you live outside those cities, that doesn’t necessarily mean there’s not a market for your new business. In fact, being one of the first to the scene has the advantage of helping you garner some buzz (and perhaps even some press). However, if you’re thinking of starting a small business in the food and restaurant, retail, health and beauty, or contractor industries, it’s also crucial to look at things on a more macro level. Below is an overview of the current landscape of the food and restaurant, beauty, contractor, and retail landscape, as well as emerging trends in each. Knowing where things stand — and where everything is headed — will be instrumental before you decide on the best small business to start. You often hear people say doomsday things like “50 percent of restaurants fail.” While there may be some truth in that sentiment (starting a restaurant is no easy or inexpensive feat), there also are encouraging statistics to show that restaurants are on an upswing. The National Restaurant Association predicts that industry sales will reach a total of $782.7 billion in 2016, up from $586.7 billion in 2010. It also predicts that restaurant job growth will outpace the economy in 2016, so clearly, the industry at large is experiencing growth. But that’s not to say that offering kale salads and quinoa is a shoe-in. In fact, quite the opposite. Members of the American Culinary Federation predict that in 2016, kale salads, quinoa, and surprisingly, gluten-free cuisines will trend down. Rising instead are ethnic foods, specifically African flavors, which are an under-explored niche. 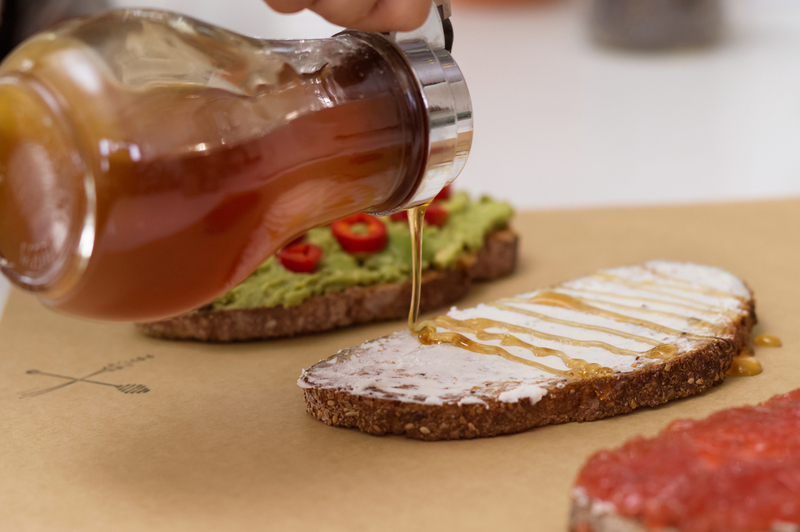 Those thinking of starting a small business in the food space should take these trends into consideration. Food trucks have also received attention over the past several years as great small businesses to start. There’s no denying that the market is hot (you’ve seen those lines around the block). And the data backs it up. The mobile food truck industry is in its seventh year of consistent growth, with a total annual revenue of $1.2 billion in 2015. Though there’s an estimated 4,130 food trucks in the U.S (that each generate an average yearly revenue of $290,556), there’s still room for more. Many cities around the country are still in the process of figuring out how to regulate the industry, with several leaning toward ordinances that allow food trucks to thrive. So if you live in a city without a buzzing food truck scene, do some research on where things stand with your local government — it always helps to be one of the first to the scene. And if you live in a place that’s already saturated with food trucks, think of ways you can differentiate yourself to stand out. Like, for example, offering food for dogs. The retail industry is also experiencing growth, with the National Retail Federation (NRF) forecasting that industry sales will grow 3.1 percent, higher than the 10-year average of 2.7 percent. But having a strong online presence is increasingly important: the NRF expects non-store sales to grow between six and nine percent in 2016. So if you’re opening a local brick-and-mortar retail shop, it’s crucial to also develop an omnichannel experience. That means investing in an e-commerce platform, specifically one that’s optimized for mobile. Forrester predicts that in 2016, mobile and tablet commerce will reach $142 billion in the U.S., representing 38 percent of all online transactions. And more than 30 percent of sales will have a mobile-cross-channel component — which means that from product research to in-store interactions, customers will use their mobile device at some point throughout their purchase life cycle. In terms of merchandising, there’s a trend toward a “less is more” experience — meaning small, highly curated selections rather than ones with a ton of items (which is illustrated by the rising popularity of companies like Everlane). A curated, subscription service for a specific target demographic is also a great small business idea, as that approach makes it quicker and easier for customers to choose products. Pop-up shops are another avenue to consider when you’re mulling over the best businesses to start. According to Popup Republic, the pop-up industry has grown to approximately $10 billion in sales. Not to mention the fact that opening a pop-up is 80 percent less expensive compared to opening a traditional brick-and-mortar shop. But given the trend toward omnichannel, if you go the pop-up route, it’s a smart idea to supplement it with an online presence. Also, pets. That industry continues to rise. People aren’t going to stop needing haircuts. Which may be one of the reasons why you might want to open a salon. The beauty industry is particularly resilient and according to Franchise Help’s 2016 Beauty Industry Analysis Report, beauty businesses generated $56.2 billion in 2015. As you might expect, hair care is still the industry’s largest segment, with over 86,000 locations nationwide. But skin care is growing fast. That segment of the industry is expected to have revenue of almost $11 billion by 2018. Experts attribute this growth to an increasing awareness of the importance of skin care — more specifically, an increase in the market for men. But getting into the beauty industry doesn’t necessarily mean that you need to open your own brick-and-mortar location (which can get expensive). With an overall cultural shift toward the importance of extreme convenience, “going mobile” is an option to consider. That way, you can go to clients and work in a variety of locations (and also avoid having to abide by a salon or barbershop’s set hours of operation). The construction industry is poised for a strong year, with Dodge Data & Analytics predicting six percent growth in 2016. In line with an overall consumer appetite for ecofriendliness, green building continues to flourish — accounting for 26 to 33 percent of the total residential market. However, you may want to focus on renovations rather than new homes. Perhaps because of the mortgage market (or people’s perceptions of it), a lot of people are staying put in their current homes. 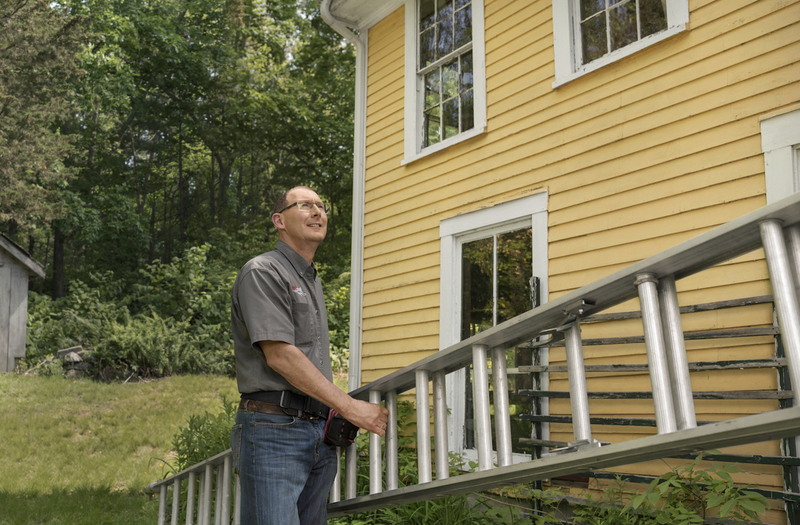 So marketing yourself as a renovation company (and a green one) may be more lucrative. With the right strategy around your location, your niche, and your marketing practices, it’s a great time to start a small business. We hope this data helps you narrow down the best small businesses to start — and where to start them. As you’re starting a business and acuiring new clients, you’ll want to make sure you remain organized and get paid on time. Writing a contract is a great way to create a shared understanding and set expectations for clients early on. With a contract, you can provide a framework for the scope of work, disclose payment information, and minimize disputes along the way. Square has free contract templates that allow you to easily create a custom contract that matches your business needs.